Are you shopping for a new full-size passenger wagon? The Ford Transit is a popular wagon among consumers here at Sale Ford of Kinston. 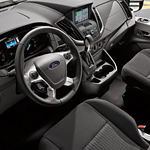 We strive to keep our customers updated about our models, so we welcome you to read more to find out what technology features are offered with the Ford Transit. The Transit comes with the Lane-Keeping Alert with Driver Alert System. Lane-Keeping Assist uses a camera to monitor lane markings, and when unintentional lane drift is detected, the driver will be issued an alert through vibrations on the steering wheel. When the Driver Alert System detects that lane drift is because the driver is tired, it will send the driver audible and visual alerts. You also get SiriusXM Satellite Radio with the Ford Transit. SiriusXM Satellite Radio provides you with more than 150 channels of music, news, entertainment, sports, comedy, and more. The six-month trial also lets you listen to SiriusXM online with the SiriusXM app.